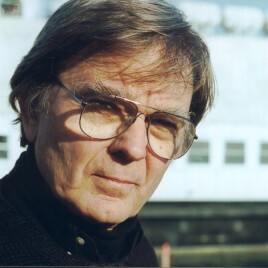 Robert Coover (born 1932) – an American prose writer and an emeritus professor of the Brown University. He is regarded as the most important representative of literary postmodernism alongside Pynchon, Barth or Barthelme. An avid lover of metafiction and the accumulation and overlapping of stories. In his books, he loves drawing inspiration from pop culture by building plots based on collective images and genre clichés. This can be seen, for example, in the novel Ghost Town, which plays with the convention of the Western genre as a whole, or in A Night at the Movies – a collection of short stories where we constantly come across film quotations the sources of which cannot be identified precisely. He was one of the founders of the Electronic Literature Organization – a foundation supporting electronic literature.